We must congratulate one of our affiliated umpires Rob Cann on his recent Level 3 Umpire Award! A small number of umpires each year complete the Level 3 Umpire Award and become members of the National Programme Umpiring Association (NPUA). 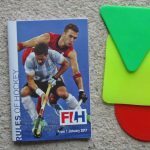 Working closely with England Hockey, the NPUA is responsible for the development of umpires operating in the National Leagues.